Your floor is among the first things every visitor notices and it needs to look its best. Wooden floors remain ever-popular, because of their beauty and easy cleaning, but even the toughest hardwood floor needs restoration – every once in a while. Whether you have soft or hardwood floors, we can be of service in the process of their restoration. 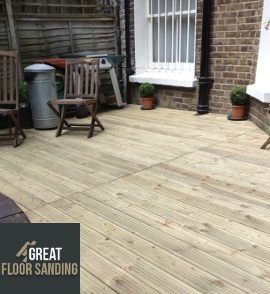 You can trust in our floor sanding in Fulham SW6 to remove every blemish on your floor and seal it for years to come. What Our Fulham Floor Sanding is Known For? What makes us the ideal choice for your floor sanding in Fulham is the fact that we value quality above all else, and you’ll find this in the craftsmanship. All technicians in the employment are BONA certified and operate with high-grade equipment that delivers impeccable results and absorbs the fine dust particles. In the end, you return to immaculate floors and a clean house, office or flat. So save yourself time and effort and trust in our proven excellence. It’s easy to request an expert wood floor sanding team to your property. All you have to do is dial 020 3404 9697 to get in touch with one of our representatives and schedules in a viewing. Contact us at any time from Monday to Sunday even on holidays to receive further details on your requested service, edit the details of your viewing or inquire about special discounts. We’ve also got a chat facility and contact form right here on our website.